Almost every trader used or at least took a look at Gerald Appel's MACD. Looking at our Old Bag of Tricks we rescued a technique several traders used/use which is adding additional filters to MACD in order to avoid false or weak entry signals over traditional crossovers. We cannot recall in the material we rescued where/when this technique was created and who was the author, so if you know that, please tell us and we will credit him/her properly. 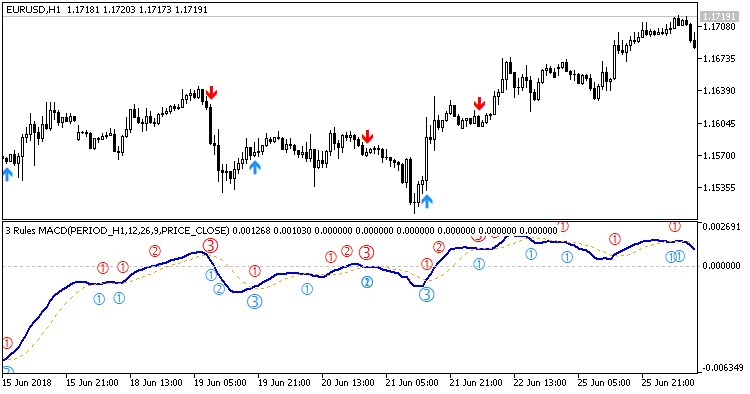 The rules are quite simple and we split the indicator in 2 parts, so the user can use the first part as a starting point for a trading setup - for manual trading or plugging in into an EA - and the second one as a visualizer for the patterns being found in the chart. We love visual cues so we did the maximum in this second part so the users willing to use this indicator as a part of a setup (or filter) in a manual trading operation gaining visual aids as the entry point is arriving. When MACD line (blue) crosses below the Signal line (dotted orange), AND. When MACD line crosses below Zero line, AND. When MACD line crosses above the Signal line. When MACD line (blue) crosses above the Signal line (dotted orange), AND. When MACD line crosses above Zero line, AND. When MACD line crosses below the Signal line. Indicator 1 Minions.3RulesMACD_Signal can be used alone and/or be plugged in as a entry signal or a filter. It shows on a chart the theoretical BUY and SELL signals as colored arrows. Indicator 2 - Minions.3RulesMACD_Patterns can be added to the chart along with indicator 1 or used alone. Both indicators have no internal bond between them. This indicator 2 will open in a sub window, plot the traditional MACD in a 2-line format (no Histogram) and additionally will plot in colors the formations of the entry points, numbering them as 1-2-3, being 3 the climax, that corresponds the the arrows found in Signal indicator 1. Hope this indicator will be useful to the community! Please feel free to post bugs, comments, ideas and tips on what type of markets, stocks and timeframes this indicator performs well. Thanks for this code, its really awesome. How do I use this to create an EA, auto buy & sell?